President Trump doubled the tariffs on Turkish steel and aluminum on Friday, causing the Turkish lira to plunge by 16%. The higher tariffs come amid tensions over American pastor Andrew Brunson, who is detained in Turkey, and Turkish cleric Fethullah Gülen, whom the U.S. has refused to extradite from Pennsylvania despite Turkey's allegations of his ties to the failed July 2016 coup. The big picture: While President Trump himself benefits politically from a trade war with allies, it is actually Russia that stands most to gain from a weakened Turkey. 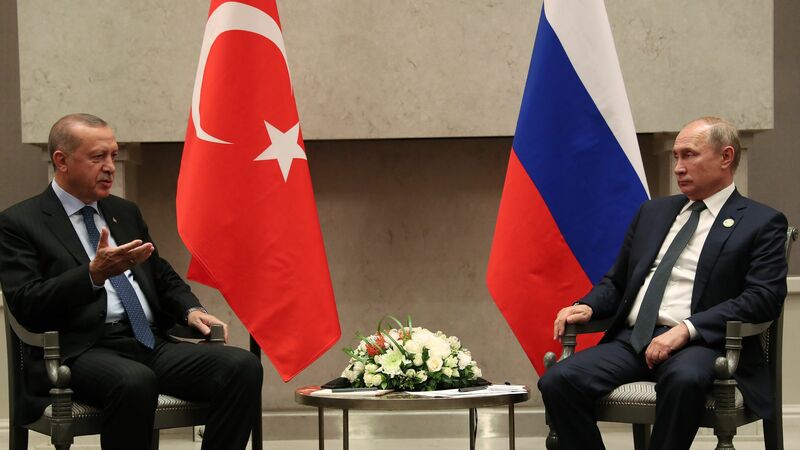 Despite the amicable diplomatic and military coordination between President Erdogan and President Putin in Syria, Russia views Turkey as a geopolitical threat in Eurasia. Russia has attempted to use the Astana peace process to keep its Turkish adversary close, and a widening rift between Washington and Ankara will ultimately redound to Putin's benefit. Turkey is attempting to reduce economic dependence on Russia by diversifying its sources of natural gas, most notably with the construction of the TurkStream and Trans Anatolian Natural Gas (TANAP) pipelines. These projects would transform Turkey into a hub for the transit of natural gas from Central Asia through Europe, providing Europe an alternative to Russia's Nord Stream 2 pipeline project and allowing Turkey to flex political muscle across Eurasia. But the tariffs may hinder these plans. Against this backdrop, Assad has been consolidating control over Syria, with Turkey defending its stake in Idlib, the last armed opposition stronghold in Syria. Turkey's opposition runs counter to Russia's aim to help Syrian President Assad retake all of Syria, and Russia will now look to squeeze Turkey even further, this time by its proxy in Damascus. Already hosting 3.5 million Syrian refugees, Turkey could soon face another humanitarian crisis if Idlib, with a population of around 1 million people, suffers the same fate of other Syrian cities that refused to surrender to Assad. What's next: It is unlikely that Turkey will capitulate to Russia in Syria. Should the country find itself strained to handle a currency collapse and a crisis on its southern border as a result of these latest tariffs, relations between Turkey and the West could be bruised for a long time. Putin will continue to use his proxies in Washington and Damascus to defang geopolitical competition.